Treat breakouts quickly with the Light Therapy Acne Spot Treatment! Clinically proven to speed the reduction of breakouts without causing flaking or itching! The red and blue lights penetrates the skin and targeted pimples. It can be used for all skin types, anywhere and everywhere! This technology is not new to this world as many dermatologists have been using this for a long time now. The LED lights go through various layers of the skin and penetrates the skin gently. The acne-causing bacteria will be targeted by the blue lights and the acne inflammation will be targeted by the red light. It really works! 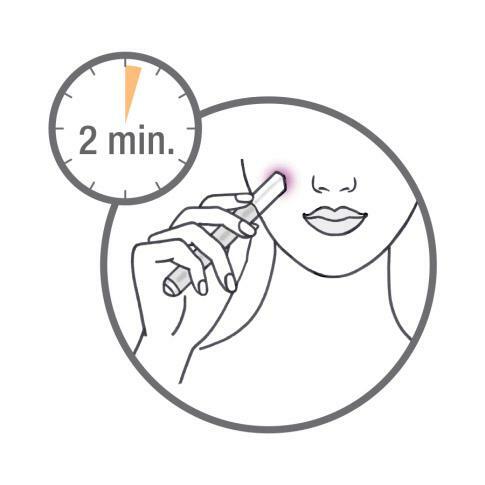 If you start right away a pimple will be gone in 2 days! It works, very exciting! No irritating chemicals or drying cleansers. I think the pen is a bit stronger than the mask and great for spot treating. It does help dry out bacteria. Good for an at home quick option. I used this a couple of times and it really works. Pleasantly surprised! This really quickens the healing time of cystic acne! Excellent product! Has saved my skin by gently reducing blemishes. Self-timed for two-minute application. Product is well-made. I begin to notice results the next day or two. Mainly reduction in size and redness. Still takes time to heal.